NOTE: Hue began its life as "Cloudera Desktop," so you may find references to "Desktop" in a few places. 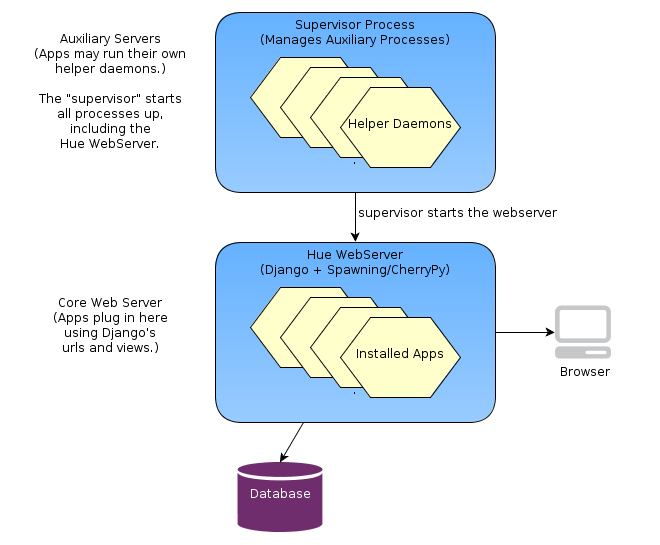 In addition to the web server, some Hue applications run daemon processes "on the side". For example, Beeswax runs a daemon ("beeswax_server") that keeps track of query states. Running a separate process for applications is the preferred way to manage long-running tasks that you may wish to co-exist with web page rendering. The web "views" typically communicate with these side daemons by using Thrift (e.g., for Beeswax query execution) or by exchanging state through the database. Hue provides a front-end framework based on Bootstrap and jQuery. If you are used to the Hue 1.x front-end, this is a major difference. All application pages are full screen requests from the browser. The HTML generated by your application's template is directly rendered. You do not need to worry about interference from another application. 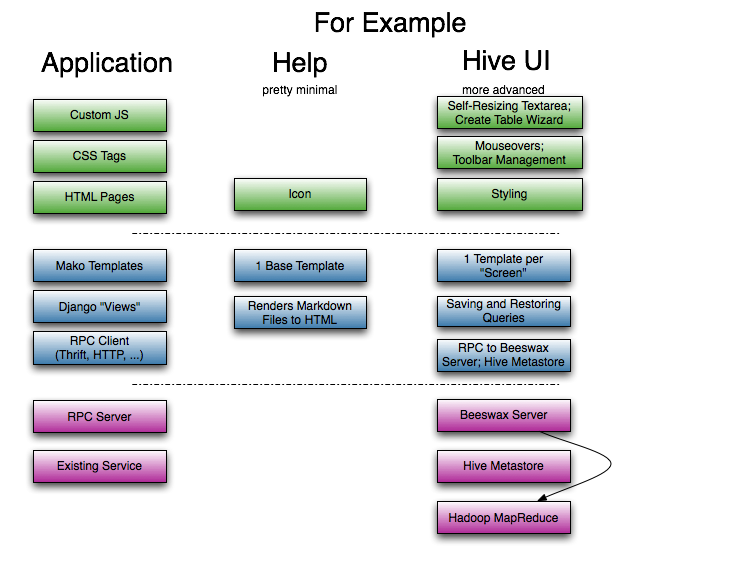 And you have more freedom to customize the front-end behavior of your application. Developing for the Hue SDK has similar requirements to running Hue itself. 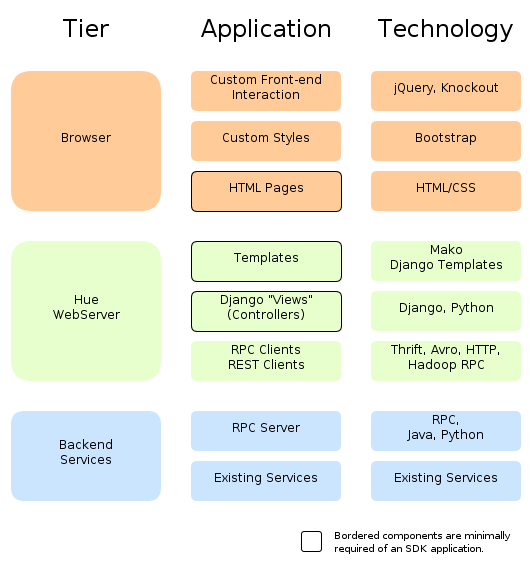 We require python (2.4 to 2.7), Django (1.2 included with our distribution), Hadoop (Cloudera's Distribution including Apache Hadoop, at least version 4), Java (Sun Java 1.6), and Firefox (at least 3.0). The Hue SDK is available from Github. Releases can be found on the download page. Releases are missing a few dependencies that could not be included because of licencing issues (e.g. the werkzeug module). So if you prefer to have an environment ready from scratch, it is preferable to checkout a particular release tag instead. Why runserver_plus? runserver_plus enables the Werkzeug debugger, which is very handy. For more complicated forms, you may want to use Django Forms and avoid explicitly using request.REQUEST, but this is shorter. Great! Now that we've added a single application, we're going to delve further into the back-end. The Help application is as minimal as they get. Take a look at it! The core logic is in the "views.py" file. The central function there takes (app, path) (which are mapped from the request URL by the regular expression in urls.py). The view function finds the data file that needs to be rendered, renders it through the markdown module, if necessary, and then displays it through a simple template. and the page will be displayed within Hue. #Comma-separated list of regular expressions, which match 'host:port' of requested proxy target. #Comma-separated list of regular expressions, which match any prefix of 'host:port/path' of requested proxy target. # This does not support matching GET parameters. You can create a new app (or modify a current one for testing). or alternatively get the page in the view (better solution) with the Hue REST API. Example of use of this API can be found in the HDFS lib. If you need to browse through the proxied page, using an iframe might be a better solution. "Under the covers:" Threading. Hue, by default, runs a Spawning web server. It can also be configured to run under a CherryPy WSGI server. This server is multi-threaded, so you can use python threading support (such as it is). The "runserver_plus" version is single-threaded. If Hue is configured (and it may be, in the future) to use mod_wsgi under Apache httpd, then there would be multiple python processes serving the backend. 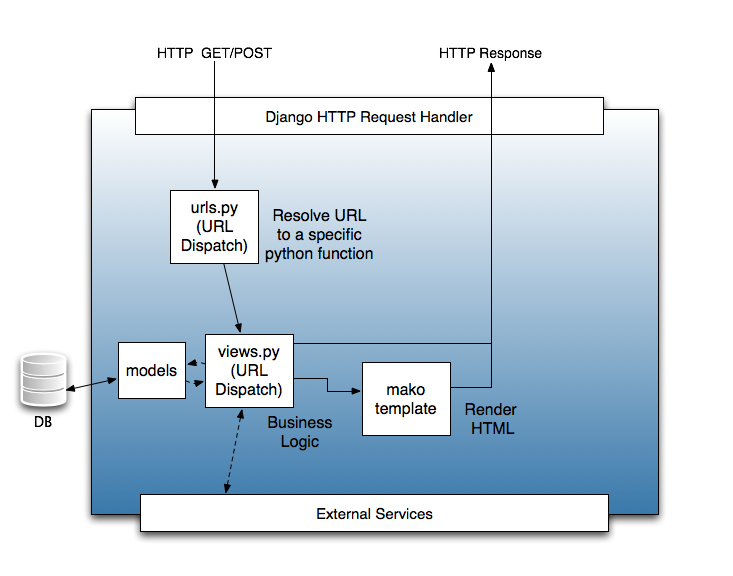 This means that your Django application code should avoid depending on shared process state. Instead, place the stored state in a database or run a separate server. 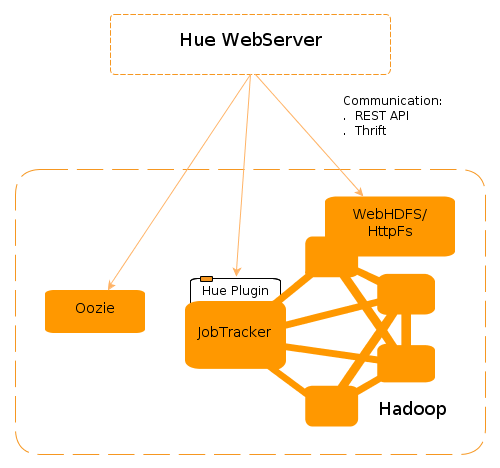 Hue works in any WSGI-compliant container web server. The current recommended deployment server is the built-in CherryPy server. The CherryPy server, which is multi-threaded, is invoked by runcpserver and is configured to start when Hue's supervisor script is used. Meanwhile, runserver and runserver_plus start a single-threaded testing server. For persistent global state, it is common to place the state in the database. If the state needs to be managed with application code, a common pattern to push state into a "helper process". For example, in the Job Designer, a helper process keeps track of the processes that have been launched. The Django views themselves are stateless, but they talk to this stateful helper process for updates. A similar approach is taken with updating metrics for the Beeswax application. In a nutshell, front-end development in Hue is using Bootstrap and jQuery to layout your app and script the custom interactions. You can use standard HTML links to other applications. You do not need to register your application with the front-end, or declare any dependencies using YAML. The navigation bar is not pluggable in Hue 2.0. The old "accordion" behavior can be replaced by Bootstrap collapse. The old "art buttons" pattern can be replaced by Bootstrap buttons, and button groups. The old "art inputs" pattern can be replaced by Bootstrap form inputs. The old "autocomplete" behavior can be replaced by jQuery autocomplete or Bootstrap typeahead. The old "collapser" behavior can be replaced by Bootstrap collapse. The old "context menu" behavior can be replaced by Bootstrap button dropdowns. The old "fittext" behavior is no longer supported. The old "flash message" behavior is no longer supported. The old "html table" behavior can be replaced by DataTables. The old "overtext" behavior can be replaced by Bootstrap form placeholder. The old "popup" behavior can be replaced by Bootstrap modals. The old "side-by-side select" pattern is no longer supported. The old "splitview" layout is no longer supported. The old "tabs" layout can be replaced by Bootstrap tabs. The old "tool tips" behavior can be replaced by Bootstrap tooltips. Use runserver_plus. If you want to set a CLI breakpoint, just insert __import__("ipdb").set_trace() into your code. If you want to inspect variables, you can simply insert raise None, and visit the URL of the view you're interested in, activating the Werkzeug debugger. 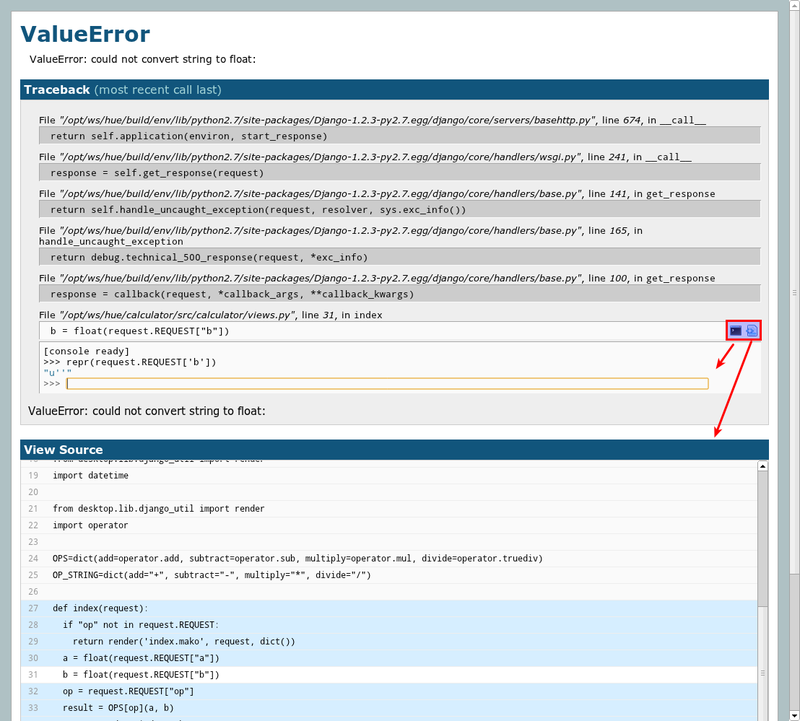 We highly recommend developing with the Firebug debugging plugin for Firefox. With it enabled, you can use a utility called dbug which wraps Firebug commands. This allows you to leave debug statements in your code and display them on demand. In particular, typing in dbug.cookie() in Firebug will set a cookie in your browser that will turn these statements on until you type that command again to toggle them off. You'll see some of our own debugging statements and you can add your own. In the future, entering this state may also provide access to additional debugging features. When the dbug state is enabled in the browser, right clicking on elements is re-enabled which makes element inspection a little easier in Firebug.